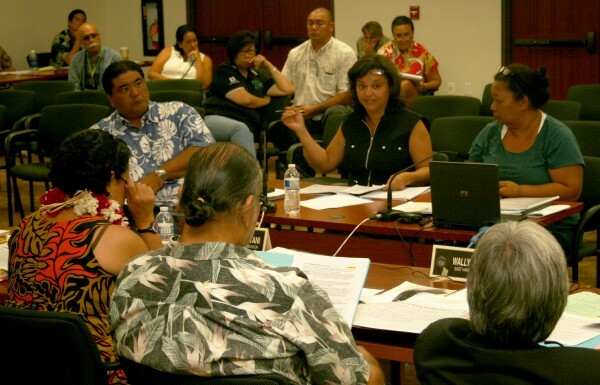 KAILUA-KONA, HAWAI‘I – The Hawaiian Homes Commission welcomed testimony today from representatives of the Council for Native Hawaiian Advancementʻs (CNHA) Policy Center on suggestions to address concerns raised by a State Auditor’s report earlier this year. Presenting testimony on behalf of CNHA’s Policy Center are Robin Danner (center), representing the Sovereign Councils of the Hawaiian Homelands Assembly (SCHHA), and Blossom Feiteira (right), representing the Association of Hawaiians for Homestead Lands (AHHL). The roundtable recommendations focused on loss mitigation options to address DHHL’s high loan delinquency rate, a challenge highlighted in the state audit. Options suggested by CNHA include forbearance, where the lender allows reduced or suspended payments for a short period of time, and modification options, which include adding missed payments to the existing loan balance, changing interest rates, or extending the number of years of loan repayment. The feedback presented is a result of CNHA’s roundtable discussions from its annual convention. Feedback from the convention as well as those being submitted by other beneficiary organizations will be helpful in assisting the Department in better serving native Hawaiian beneficiaries.